While our UR-GE and HİSER projects provide support to the members who want to become an exporter, our companies also strengthen their position in international markets. Companies with effective promotional and marketing techniques, which can exhibit their differences regarding their products and services in an increasing competitive environment, become advantageous in the competition. Bursa as the production and export base of our country, the increase in competitiveness is also of great importance in realizing the goals we have set as a country. Nearly 500 member companies were brought together in clustering groups formed with the cooperation culture which consists of strategic sectors such as; Aerospace, Defense & Aviation, Railway Systems, Baby-Children Ready-to-Wear, Machinery, Food, Textile, Composite, Chemistry, Tourism, Renewable Energy, Automotive and Construction. 14 UR-GE and 1 HISER project has been realized with 75% of subvention and approximately 360 Million TL of fund. 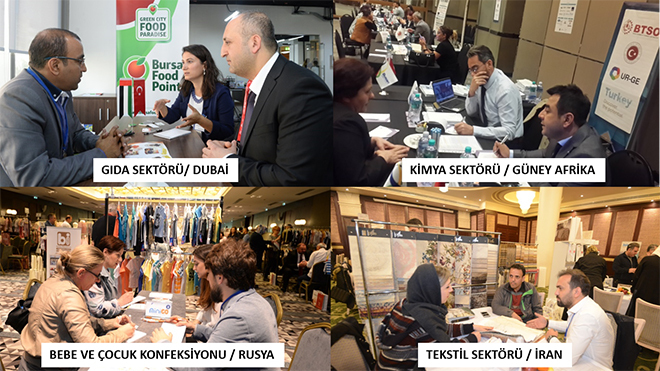 14 needs analysis, 73 Training, 24 Counselling, 43 International Marketing Activity has been carried out within the scope of our projects and 4.300 foreign investor established meetings with the project member companies at the b2b organizations in our city within the scope of 30 procurement delegation activity.